Complexities are a reality in any industry and the automotive sector is no exception. The commonality of long lead times in this space will transition into shorter production cycles as shifting consumer expectations and the digital, connectivity era drive new automotive demand. Growth of the light vehicle assembly market and additional factory sites (67 of which will be located in Asia before 20201) are also factors many anticipate will challenge the automotive space. As a result of such changes, the automotive market may be open to new risks in their supply chain. As various industries and companies are faced with their own unique challenges, it is important to weigh all the considerations when working to understand and address risk. Increasingly considering Contingent Business Interruption (CBI) insurance and additional supply chain risk management (SCRM) strategies are just some of the ways company leaders can focus on risk. In this blog article, Brian Jenkins, Risk Financing Manager at General Motors, discusses GM’s strategy for CBI insurance to help manage supply chain risk. 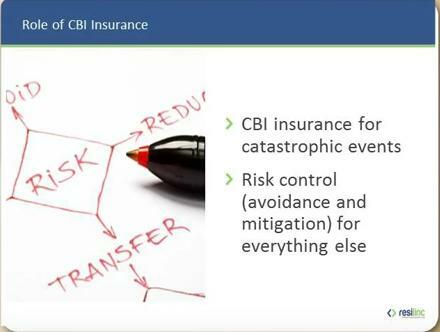 What is the value of Contingent Business Interruption (CBI) insurance? And what are some of the dos and don’ts to help manage risk? Different organizations take different approaches to insurance. We really only want to buy insurance for catastrophic events. We focus most of our efforts on risk control to either avoid losses or mitigate them to the extent that we can through our risk management efforts. Insurance doesn’t do much to help us with that. That said, underwriters’ questions can help your organization focus on certain issues or areas of risk. But compiling an underwriting submission to buy insurance and perfecting insurance claims are activities that can take a lot of time, which just reinforces our approach of buying insurance only for the low-frequency, high-severity events. But we also realize that we can’t predict and model everything, so we look at insurance as a sort of last resort, as a source of capital when something truly catastrophic happens. What type of insurance coverage applies? What type of data is or isn’t needed to buy the coverage? Insurance companies offer contingent business interruption insurance, which covers things like extra expense, continuing expense and lost profit following an ordinarily insured event resulting in physical damage that prevents a supplier from supplying goods or services. The insurance can cover you for losses from catastrophic events that happen within your supply chain. The coverage is usually made available as part of your normal property and business interruption insurance (or time element) as a coverage extension. The coverage that insurers are willing to offer on a given risk may vary, depending on the industry involved and the complexity of risk within that industry’s supply chain. An insurance broker would certainly be able to help anyone understand what coverage a given industry or risk may be able to buy in the insurance marketplace. To buy the coverage, you’re going to need to help underwriters understand your supply chain, how you manage insurable supply chain risks, and potentially even provide a listing of the location of specific suppliers. Insurers may also want to know what you see as the worst-case scenarios and what you’re doing or can do about them. How is impact measured by the insurance industry? They’re going to look at the magnitude of potentially insured loss. In other words, how much they might have to pay you for extra expense, continuing expense and lost profit if something happens. This is actually one of the big challenges with CBI insurance. How can you measure, with a reasonable degree of accuracy, what impact a given event may cause? With the supply chain, there are so many variables that come into play after an interruption—like recovery time, dual-tooling or alternative suppliers—that it’s really hard to know what the impact will be. Insurance companies understandably want to model risk to quantify what they may be faced with. But the complexity and fluidity of the supply chain makes that really difficult to do. When trying to measure the potential cost of an interruption, it’s very scenario-specific. I think you have to be careful that you don’t end up overstating the exposure. How do solutions like Resilinc’s help? Well, part of the value is just demonstrating that you take the risk seriously enough that you’re willing to go to great lengths to understand and control it. Supply chain risk is obviously a real challenge. It’s really important to help insurers understand what you’re doing to minimize your—and their—exposure. Being able to demonstrate commitment is a starting point. The Japan earthquake in 2011 really showed the value of being able to quickly understand potential impact. The main thing for me is the collaboration between our insurance-buying activity and our supply-chain organization. We’ve really worked closely together and it’s made a difference. We’ve shared some of the analyses we do, to support the insurance-purchasing decision, with our supply chain group. And through our group, the supply chain organization has talked directly to our insurers, so they’re hearing the message directly from the experts. That means a lot to underwriters. After Japan in 2011, the market for CBI insurance became really difficult. Insurers maybe hadn’t thought about the risk enough before Japan and then there was this massive pressure to catch up. Being able to share our approach and conclusions has been really helpful in the insurance-buying process. There’s no doubt in my mind, that sharing with insurers the approach and progress of our supply chain group—through our partnership with Resilinc and in other areas—has improved our insurance coverage. Without getting into specifics, we’ve received universally positive feedback from our insurance partners.